First post here. On my way to work this week i saw the NYC Dept of Sanitation removing abandoned bikes, which they do from time to time. Sitting in one of their wheel barrows was this Gios, sans rear wheel and seat post. I asked if the team removing them if they were tossing it, they said yes, which I then asked if I could take and they said yes. So here I am. Next move is to figure out what to do. Paint is rough, components are great. 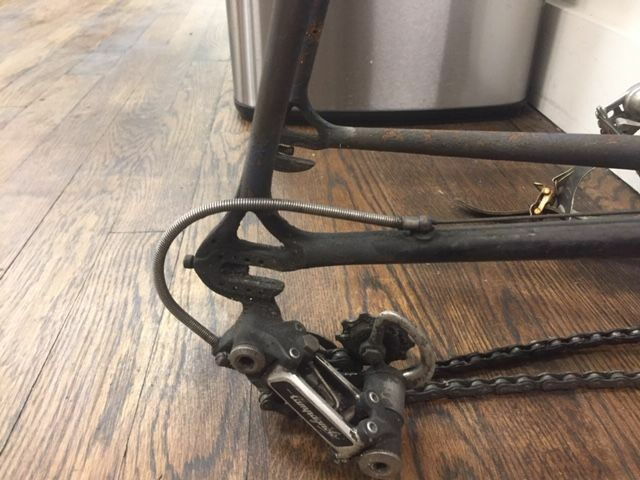 LBS said the frame and fork were slightly bent, but not terribly. Minor dent in top tube. Since its steel, I think its fine. No visible structural issues. Should I paint? Should i just get period accurate parts and let it exist as a rat rod of sorts? Happy to hear all yalls thoughts. Have pics but cant upload ATM??? You need to have 10 posts to upload pics. Maybe describe it. Post serial numbers. Date codes on components. No you should not paint. You should salvage the parts instead. Offer up the frame and fork on C/L to someone with the time/tools/aptitude to straighten and paint the frame. Painting a frame with damage makes basically no sense. Now if its your dream bike, sure, have the frame straightened, paint it, find the missing parts. Depending on the quality of the work, you could dump another $1000 into it (at which point you will be upside down on it value wise, but its your dream bike). good call. I think im just gonna find period specific parts for it and go from there. any suggestions on wheels that were made this era? Or something "classic" so to speak? Yeah, please let us see that guy! The "aero" bikes are usually pretty rare. Rare enough that It doesn't really sound like it's too damaged for a street rescue. This is a rare frame. Reportedly there were only 200 manufactured, in late 1981 to early 1982, for the 1982 model year. They were sold as both frame and complete bicycles, so the component selection is flexible, though Campagnolo Super Record was most common. 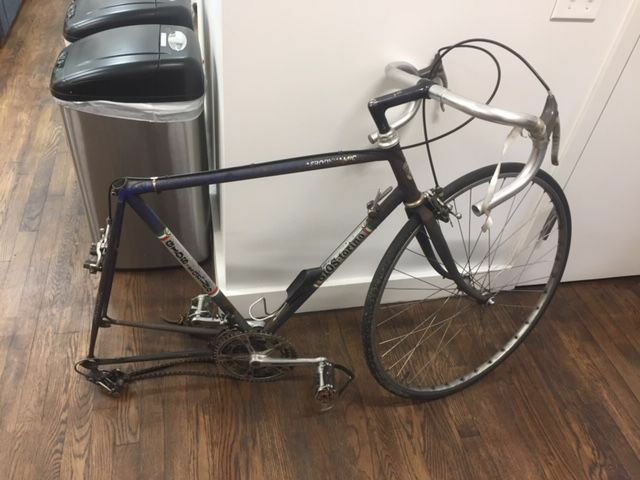 There are some obvious issues besides the frame. The inner chainring shows significant wear but fortunately the outer, pantographed chainring looks good. At least one pedal is missing the dust cap and the races may be compromised. My selection for hubs would be Campagnolo Record, small flange, 32 hole. Factory issue for this period would have been Mavic. The OP will have to decide if they want to go with more appropriate tubular rims and tyres or more durable wired-on. If it's the latter, I believe that the hard anodized G40 was introduced for 1982. Given the rarity, the frame definitely warrants a restoration. Whether the OP wants to take that on or flip it for a quick profit, is his decision. This is one bicycle where the increase in value may justify the investment. Thanks for the photo assist here. My current goal now is to get it rolling. Luckily my LBS specializes in old road bikes so they are pretty knowledgeable. I did clean it up a little with some soap and water. Im going to clean chain rings and derailleurs then go from there. 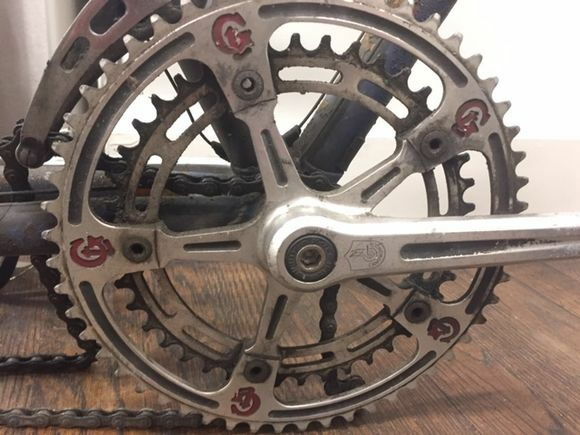 Also, I believe at the bottom of the bottom bracket it is stamped "58" and i dont believe this the size, as its closer to a 55cm? Is the serial number? Very nice dumpster dive find. Look, whatever you decide to do, you are going to come out ahead here, either in cash dollars or experience. Most of us here would opt for the experience. Great win-win situation-- have fun! That Profil bottle cage probably came stock along with a Profil model Concor saddle. That was done on many of the different Aero models in the early 80's. Those can be gotten in all kinds of condition, from new old stock to quite well used. Here's a link to the bottle. Aerodynamic? What am I missing? Very rare stunning Gios Aerodynmic vintage road racer from 1982. Gios produced the first model Aerodynamic only for two years and very limited number of 200 frames have been hand-built. The frame and fork are made of Columbus Air steel tubing with aero shifter's position and sloped fork. For the year 1982 it was a very (!) advanced steel frame! 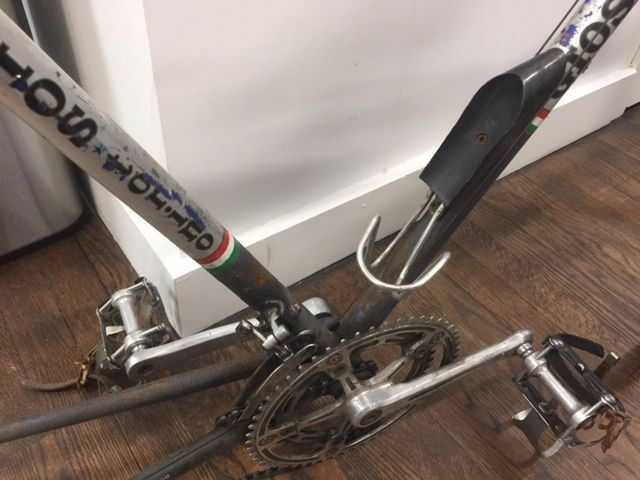 It has an Aero front fork (dimpled like the Gios Compact) as well as aero seat stays and perhaps ovalized tubes in the main triangle..not sure of the this. Aero for the time but not so aero now. It has Aero front fork (dimpled like the Gios Compact) as well as aero seat stays and perhaps ovalized tubes in the main triangle..not sure of the this. Thanks. I noticed the fork crown was not that standard flat style but missed the shifters. You just can't tell any tubing detail from this pic. Just note that these NOS Cobra aero bottles don't smell so good inside (chemical outgassing) and I suspect will taint any drink you put in it. I have a yellow one, NOS with the Medici lion silk screened on it. Beautiful and perfect for my Medici Aerodynamic bike, but the bottle and cage is just "for display". Looking forward to seeing more pics of the bike. Or just post 3 more times. Once you hit 10, you can post the pictures. My buddy has a black Gios Torino Aerodynamic. I’ll post some pictures after I’m allowed to. Great find!